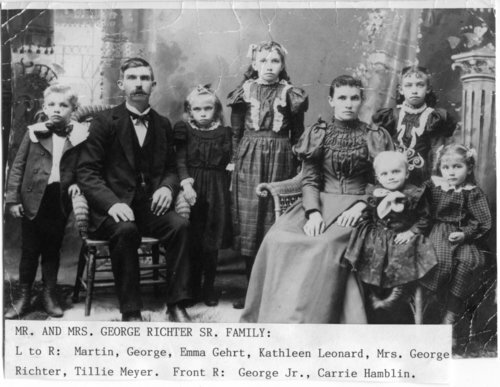 This is a studio portrait of George Richter, Sr. and his family, including his wife, Emilia Mueller Richter, and seven of their children Martin (b. 1892), George (b. 1896), Emma Richter Gehrt (b. 1890), Kathleen Richter Leonard (b. 1888), Tillie Richter Meyer (b. 1889), George Jr. (b. 1896) and Caroline "Carrie" Richter Hamblin (b. 1895).